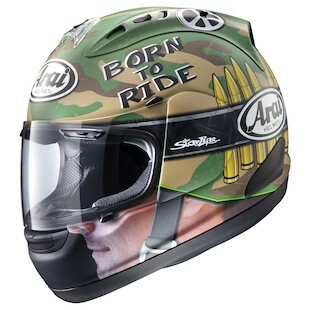 Arai Corsair V LE: Be the Kentucky Kid! Remember when you were a kid playing dress up (maybe just the ladies), pretending to be a superhero, or just liked wearing crazy masks of other peoples faces (other than on Halloween)? Well if you miss those days, or dream of looking like the Kentucky Kid, Arai has an answer for you. Cue the Nicky GP Graphic (and the crowd goes wild!). This bad boy gives you everything you’ve been looking for! You can use it to hide in the woods with the camo paint job for your afternoon paintballing (or, if you need, to run from the long arm of the law), look a bit like a fighter plane with the bullets painted on the side, and the best part, you get to…... wait for it…... wear Nicky’s face (Mind Blown!). This graphic gets down to what it means to be an American with its camo and bullets. Now all it is missing is the accompanying mounted guns and Neon Budweiser light (maybe the next iteration). For those of us who miss the days of being a kid and playing pretend, are looking for a way to stand out from the crowd, have a love of camo, or possibly fly a fighter plane, then look no further than the Arai Corsair V Nicky GP Camo Helmet. While this guy won’t give you superhuman riding skills or put you on a MotoGP podium, this fun graphic will most definitely get you noticed and have all your friends talking.